The humble Bunsen Burner! Look around any dental surgery or laboratory and the Bunsen Burner is an item you will almost certainly see. Since the use of wax in dentistry, a heat source has been a primary requirement. Originally this was supplied by a spirit burner using a reservoir of methylated spirits in a clear glass container and a wick which when ignited gave a steady if not a very hot flame. With the advent of the Bunsen Burner which was invented in Heidelberg Germany by Robert Bunsen in 1855, a soon to be indispensable item was added to the ever growing list of dental equipment. The introduction of the Bunsen Burner which ran off town gas had, amongst other things a great bearing on the design of the modern dental chair. Until the changeover from town gas to natural gas, most dental chairs had gas plumbed into them with an outlet at the bracket . The Bunsen Burner had become an indispensable item in the preparation and manufacture of dentures and other dental prosthesis. Todays’ Bunsen Burner is based on the original design, although it may be slightly different in shape and size as well as fuel source. Most dental chairs these days do not have gas plumbed into them. With the demise of town gas and the introduction of natural gas, the Bunsen Burner has lost some of its appeal as the flame is not as hot and more difficult to see. There is however an alternative fuel source which gives a flame as good as, if not better than the original town gas Bunsen. This is LPG or liquefied petroleum gas. 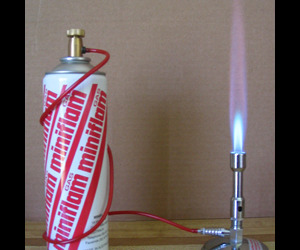 Miniflam Australia Pty Ltd developed a portable Bunsen Burner in the late 1980s which runs off disposable 300 g cans of LPG. This unit has the added advantage of having a small gauge flexible hose which lets the burner stay where you put it. The Miniflam Aussie Bunsen is the ideal solution for dentists and dental prosthetists. Being fully portable it can be used on the chair bracket and simply stored in a cupboard when not in use. It is also ideal for use in places like nursing homes and other areas where there is no other gas source available. 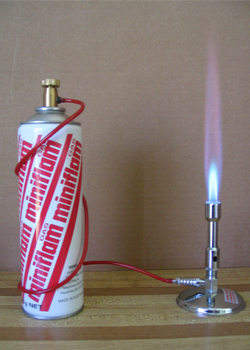 The gas which powers the Aussie Bunsen is manufactured in Australia by Miniflam Australia Pty Ltd and is particularly noted for its clean burning qualities as it is triple filtered during manufacture. Each burner comes complete with a can of gas. Because of its portability and economy of use the Aussie Bunsen is widely used by Dental Prosthetists and has the capability to turn any area into a dental lab. It is also widely used in commercial and research laboratories throughout the country. The Aussie Bunsen and Bunsen gas are also unique by virtue of the fact that they are two of only a handful of dental items manufactured in Australia by an Australian owned company.